The Arrow Head Country RC&D awarded over $49,000 in grants to 15 groups from 6 counties during their April meeting in Winamac, Indiana, including a generous $4,400 towards The Watershed Foundation’s reconstruction of 500’ of Winona Lake’s Limitless Park shoreline & public education campaign. The current shoreline and landscape of the Winona Lake Limitless Park are unintentionally contributing to poor water quality and creating a health and safety hazard for residents and park visitors. The park’s landscape of primarily turf grass, especially along the shoreline, has attracted an overpopulation of exotic invasive Canada Geese. The amount of goose droppings spread throughout the park’s lawn, trails and even the new Splash Pad, present a public health risk. According to the U.S. Centers for Disease Control, exposure to goose droppings can cause diarrhea, urinary tract infections or respiratory illness. Geese droppings can also contain salmonella and other germs that cause gastrointestinal issues. Large numbers of geese leave large quantities of feces. A single goose can defecate every 20 minutes up to 1.5-2.0 pounds of feces each day. 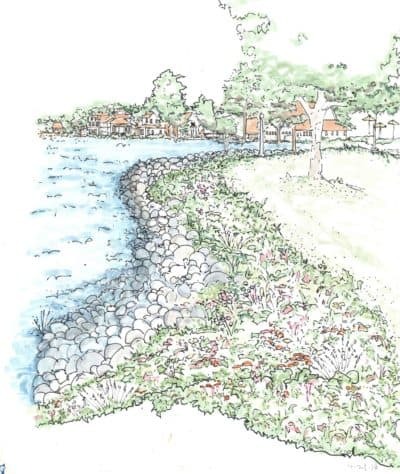 TWF is bringing together community partners to install a healthy shoreline with a mix of glacial stones and native plants along the 500 linear feet of shoreline from the edge of the public swimming beach to Cherry Creek. This will incorporate a plant buffer along the shoreline and landscaping throughout the park that is a deterrent to Canada Geese, but still attractive to park visitors. Taller vegetation at the shoreline discourages the geese because it creates limited visibility against predators, while the steeper slope into the water makes it more difficult for the geese to navigate. The EPA Region 5 model calculates that this shoreline project will stop the erosion and resuspension of 31.5 tons of sediment and stop 26.8 pounds of phosphorus from polluting Winona Lake – reducing the growth of weeds and algae by 268,000 pounds per year. Arrow Head Country RC&D has given over $235,000 in grants during the past four years to all 10 member counties. Arrow Head Country Resource Conservation and Development Area Inc. is a non-profit organization comprising all of Cass, Fulton, Jasper, Kosciusko Marshall, Miami, Newton, Pulaski, Starke, and White counties in Indiana. The purpose of the organization is to provide local leadership for developing and carrying out a plan for the orderly conservation, development, and wise use of the natural resources, thereby improving the quality of life for all the people living in the area.